Big enough to accommodate your cat. There should be enough space to turn around and get comfortable. Sturdy – you don’t want your cat to be able to get out, or even worse: the handle to break, allowing the carrier to drop to the ground. Look for a carrier with a door both on front and on the top – it’s usually easier to load cats through the top. If you have room, keep the carrier open and encourage your cat to play or rest in it. If they’re used to being in and around the carrier, it becomes a natural part of life and a point of security instead of a source of stress. 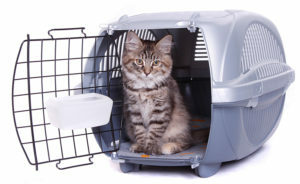 If your cat is used to the carrier and associates it with safety, loading probably isn’t a problem. Some will walk in on their own when encouraged by a toy or a treat. Otherwise, take your cat and load through top or front door. Make sure to close the door quickly, so kitty doesn’t have a chance to escape. If your cat resists, towel-wrap them like a burrito and place both cats and towel inside the carrier. This is easier through the top. If your carrier doesn’t have a top door, you can turn it on end and lower the cat through the door. Quickly close the door and lower the carrier slowly to its normal position. Never let your cat loose in a moving vehicle, even if they “talk” during transport. Many cats are vocal when being moved, but they are safer in the carrier, even if they try to persuade you to let them out.